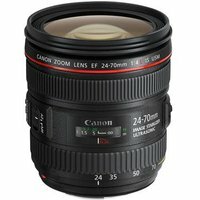 The Canon EF 24-70mm f/4 L IS Lens is a high-performance zoom lens with Image Stabilisation (IS), and an inbuilt Ultrasonic Motor (USM), which provides fast, near-silent focusing. This lens consists of 2 Ultra-Low Dispersion (UD) and 2 aspherical elements to deliver superb image quality. A 9-bladed aperture diaphragm provides out of focus areas with an attractive, soft blur.